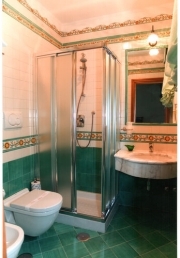 The villa is placed in Sorrento town centre, where it is possible to re- live the pleasure of walks in peace, snooping around nifty workshops of narrow streets, doing shopping in typical shops, and admire the beautiful Gulf of Naples. The villa is near the port di Sorrento, from here it's possible to reach in few minutes with hydrofoil a lot of destinations rich of interests: Capri, Positano and the Amalfi Coast, Ischia and Napoli. The villa has got a smart living room furnished with smart and comfortable sofas in damask material, lcd TV with sat connection., where the guests can spend relaxing moments. 5 rooms, each with a private bathroom, exquisitely furnished with beds of wrought iron and vietresi decorum, all with: private bathroom, TV sat, air conditioning, internet wifi, safe, minibar, hairdryer. Dish Washer, Internet/ Wifi, Garden, Sun Deck, Television, Washer-dryer, Winter Heating. The garden is 500 square metres, it is in part divided by a welcoming and spacey area furnished with comfortable wicker chairs and comfortable sofas, where it is possible to drink the famous liqueur of lemon "Limoncello". From Naples Train Station or from the Airport follow directions to the A3 Salerno-Reggio Calabria, exit in Castellammare di Stabia and follow directions to Penisola Sorrentina. 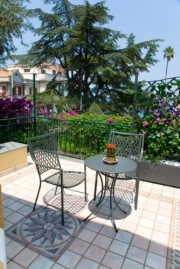 Once in Sorrento continue towards Piazza Tasso and then towards Piazza Sant'Antonino.